A particular feeling for readers with a sense of tradition. KOMET Publishing was founded in 1992 as a marketing organization for affordable special editions. Today, it is a prolific publisher of original editions, with almost 100 per cent of titles produced in-house. Active in both national and international markets, KOMET commands a strong position in the German-speaking book market as well as a stable network of international licence and distribution partners. 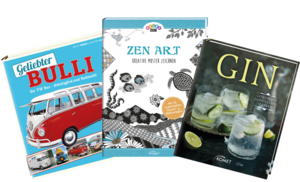 Whether it’s large format nonfiction and picture books, practical guides for hobbies and free-time or custom-fit books about regional matters, KOMET offers high-quality, illustrated books at outstanding prices. Thanks to its extensive back catalogue, the publisher can successfully offer top sellers like Das große Buch der Hildegard von Bingen, War dat lecker! Unsere Lieblingsgerichte aus dem Ruhrgebiet or Deutscher Schulatlas on a permanent basis. The key publishing strands of KOMET are Drawing and Painting, Food and Drink, Healthy Lifestyles, Nature, Gardening, Science, History and Technology. Because of its bestsellers such as DDR Kochbuch and DDR-Backbuch, KOMET is sometimes jokingly referred to as ‘the westernmost publisher for East German themes’. 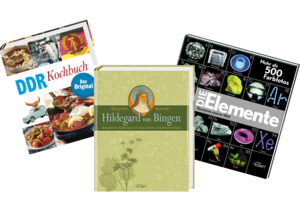 Regional cookbooks, colouring books and handicraft books at a low price are popular in many parts of Germany. Numerous rustic cookery and baking books serve our readers’ love of tradition, while people with a thirst for facts will be delighted with the solid knowledge displayed in opulent picture books such as Die Elemente or Der deutsche Wald.